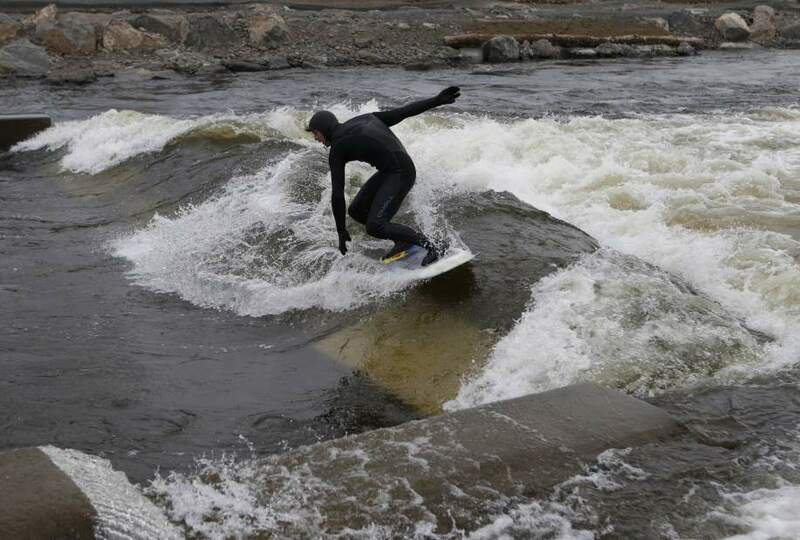 The Bend Whitewater Park is one of the most advanced man-made river surfing features in the United States. As a whole, the features in the park are created by 26 different underwater pneumatic bladders that can be adjusted to shape the river features. There are four waves in the park. Starting from the footbridge at the downstream end of the park, the waves, in order, are Jason’s, Kricket’s, the Green Wave, and Eddy’s Wave. The Green Wave is the premier river surfing wave, and can often be ideal for shortboards. If the conditions are right, it’ll give up carves and cutbacks galore. Current conditions, including descriptions of each wave from the shapers, can be found here. For the most part, the more water, the better. They also have a webcam up and running, which you can find here. The Deschutes is divided into three separate channels near the whitewater park, and the wave shape is the product of both flows and decisions made by the shapers. So the most recent report from Bend Parks and Rec, found here, is the best way to tell what the waves are up to. But generally, spring and early summer flows are your best bet.